Siemens collaborates with Airbus and other partners in the field of the electrification of aviation. The basis for electric planes will be electric drive systems from Siemens, like the world-record motor that with a weight of just 50 kilograms, delivers a continuous output of about 260 kilowatts – five times more than comparable drive systems. Siemens eAircraft will be showcasing innovation in electric filght from April 10th to 13th 2019 at the AERO in Friedrichshafen, Germany. The AERO is the global show for General Aviation. At the AERO, the eAircraft team will be telling the story of "Powering New Flight Concepts". 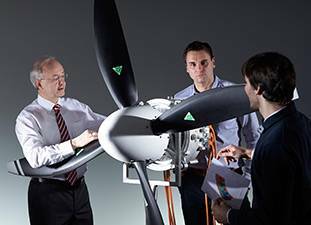 Prototypes of their electric propulsion systems especially developed for aviation are presented together with airframe manufacturers, who have partnered with siemens to power their innovative aircraft. At the Pécs Pogány airfield in Hungary on May 31, 2018, an accident happened to an experimental airplane Magnus eFusion featuring an electric propulsion unit of Siemens. According to the resolution of the Hungarian authorities released end of September, Siemens is not liable for the accident and our systems have worked without any failures during the flight. Our thoughts are with the families and friends of those involved in the incident. On April 11, 2018, the world's first flying serial-hybrid aircraft landed its maiden flight at Matkópuszta airfield in Hungary, powered by a Siemens propulsion system. This hybrid Magnus eFusion is equipped with a Siemens SP55D electric motor and a FlyEco Diesel engine to allow for silent take-off and landing with an extended range. The complete propulsion system including a new generator, inverters and control systems has been developed by Siemens eAircraft and is expected to provide meaningful insights into the application of hybrid-electric systems for aircraft during future operation. Siemens has developed a tiny inverter of highest power density for electric and hybrid-electric aircraft. It took its first flight on a Magnus eFusion electric test plane. The Siemens inverter "SD104" uses silicon-carbide semiconductors and has a micro channel cooling plate. The power electronics fits in a box of 47mm*94mm*141mm and weighs only 900g while and delivers a maximum of 104kVA of propulsive power. Since 2016 Airbus and Siemens have been working together on the development of hybrid-electric drive systems for the aviation sector. One of the pioneering aircraft that the partners are designing together is the four-seat CityAirbus. On the path to its maiden flight, which is scheduled for late this year, the aircraft has now reached an important milestone: The drive system that Siemens developed for the CityAirbus has been put into operation in a test on the ground. Heart of the electric propulsion systems is the newly developed SP200D electric motor. It has been specially designed for this specific application. It has a torque density of 30 Nm/kg, which is practically a new record - a nominal torque of about 1,500 Nm is generated with a weight of less than 50 kg. In addition to 8 coupled motors Siemens supplies the inverters and the energy management system for the CityAirbus demonstrator. This drive system was delivered in an extremely short period of time. Its development took just over nine months from the initial concept to the finished prototype. For the first time Siemens presented its' world-record electric motor for aircraft at the international Paris Air Show. The motor in the aerobatic plane Extra 330LE was demonstrated at the daily air show where the electric powered Extra took a glider up to the air. In addition to the 260 Kilowatts world-record electric motor, Siemens also presented two further propulsion systems of different power classes. Siemens has developed a new type of electric motor that, with a weight of just 50 kilograms, delivers a continuous output of about 260 kilowatts – five times more than comparable drive systems. On Thursday, March 23, 2017, the Extra 330LE aerobatic plane, powered by the propulsion system from Siemens, set two new speed records. At the Dinslaken Schwarze Heide airfield in Germany, the electric aircraft reached a top speed of around 340 kilometers per hour (km/h) over a distance of three kilometers. On Friday, March 24, 2017, the Extra 330LE gave another premiere performance by becoming the world's first electric aircraft to tow a glider into the sky. The nearly silent aerotow piloted by Walter Extra took a type LS8-neo glider up to a height of 600 meters in only 76 seconds. Siemens is contributing this technology to the cooperative project that Siemens and Airbus agreed to in April 2016 for driving the development of electrically powered flight. Electric drives are scalable, and Siemens and Airbus will be using the record-setting motor as a basis for developing regional airliners powered by hybrid-electric propulsion systems. Siemens is determined to establish hybrid-electric propulsion systems for aircraft as a future area of business. On Thursday, March 23, 2017, the Extra 330LE aerobatic plane, powered by a propulsion system from Siemens, set two new speed records. At the Dinslaken Schwarze Heide airfield in Germany, the electric aircraft reached a top speed of around 337.50 kilometers per hour (km/h) over a distance of three kilometers. On Friday, November 25, 2016, the Extra 330LE aerobatic aircraft powered by a drive system from Siemens set a new world record for time to climb. At the Dinslaken Schwarze Heide airfield in Germany, the electric-powered plane reached an altitude of 3,000 meters in just four minutes and 22 seconds – a climb velocity of 11.5 meters per second. Siemens researchers have developed a new type of electric motor that, with a weight of just 50 kilograms, delivers a continuous output of about 260 kilowatts – five times more than comparable drive systems. This record-setting propulsion system successfully completed its first public flight today at Schwarze Heide Airport near Dinslaken, Germany, where it – almost silently – powered an Extra 330LE aerobatic airplane. The new drive system had already made its maiden flight on June 24th 2016. This advance means that hybrid-electric aircraft with four or more seats will now be possible. Airbus Group (stock exchange symbol: AIR) and Siemens (stock exchange symbol: SIE) have signed a collaboration agreement in the field of hybrid electric propulsion. In doing so, the Chief Executive Officers (CEO) of both companies, Tom Enders and Joe Kaeser, have launched a major joint project towards the electrification of aviation with the goal of demonstrating the technical feasibility of various hybrid/electric propulsion systems by 2020. The motor has been specially designed for use in aircraft. Thanks to its record-setting power-to-weight ratio, larger aircraft with takeoff weights of up to two tons will now be able to use electric drives for the first time. To implement the world-record motor, Siemens' experts scrutinized all the components of previous motors and optimized them up to their technical limits. New simulation techniques and sophisticated lightweight construction enabled the drive system to achieve a unique weight-to-performance ratio of five kilowatts (kW) per kilogram (kg). The electric motors of comparable strength that are used in industrial applications deliver less than one kW per kg. The performance of the drive systems used in electric vehicles is about two kW per kg. Since the new motor delivers its record-setting performance at rotational speeds of just 2,500 revolutions per minute, it can drive propellers directly, without the use of a transmission. Siemens researchers have developed a new type of electric motor that, with a weight of just 50 kilograms, delivers a continuous output of about 260 kilowatts – five times more than comparable drive systems. The motor has been specially designed for use in aircraft. Thanks to its record-setting power-to-weight ratio, larger aircraft with takeoff weights of up to two tons will now be able to use electric drives for the first time.